Christmas is about bringing people together to savor the festive vibe and heartwarming glow of this season of giving. 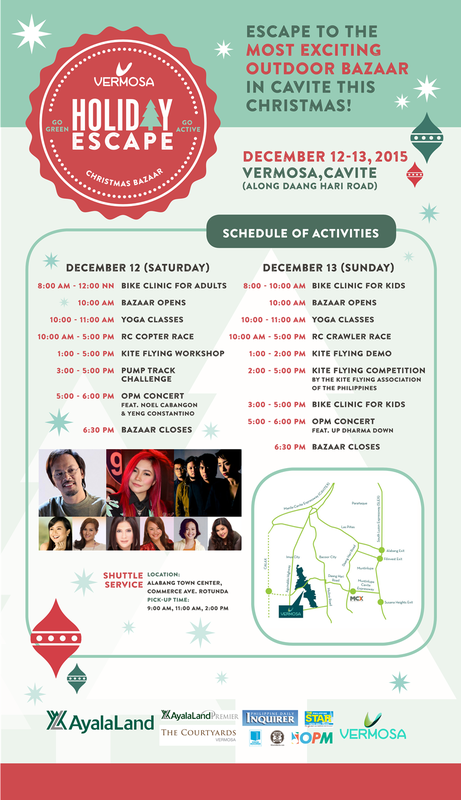 Vermosa, Ayala Land Inc.’s sprawling modern suburban community in Cavite that integrates healthy living with everyday life, holds Vermosa Holiday Escape, a fun-filled holiday bazaar that offers a much needed escape from the stressful shopping experience in the metro. On December 12 and 13, experience the vibrant holiday cheer with musical treats from some of the country’s most talented musical artists. Providing live entertainment on December 12 are pop-rock best-selling artist Yeng Constantino and acoustic favorite Noel Cabangon while indie-rock band Up Dharma Down will bring the house down on December 13. Adding more star power to Vermosa Holiday Escape are celebrity merchants led by Christine ‘Tintin’ Bersola-Babao. Shoppers can look forward to a wide range of products such as delectable and healthy Spanish-style bangus from Pinoy Big Brother winner Nene Tamayo, sandwiches and deli products from Donita Rose, skincare products from TV host and actress Gladys Reyes, curtains, bed sheets, linens and adobo from singer-comedienne Marissa Sanchez, and children’s clothes and shoes from award-winning singer-actress Vina Morales. At its core, holiday bazaars bring families and friends together to bond. Vermosa Holiday Escape goes a step further by incorporating the importance of maintaining a balanced and active lifestyle into the whole gift scouting and giving exercise. At Vermosa Holiday Escape, shoppers will have a wide range of health and wellness items and services to choose from, including organic products, relaxing massage services, active lifestyle apparel and sporting goods. Online entrepreneurs will also sell their wares, offering a new platform to the holiday shopping menu. Vermosa Holiday Escape also prepared many family-centered activities to enjoy such as yoga classes, succulent dish workshop, food trucks by Mercato, kite flying workshops and competition from the Kite Flying Association of the Philippines, and remote control crawler and copter races. Adding excitement to the two-day event are various biking activities such as mountain bike skills clinic for adults and kids and a thrilling Pump Track Challenge on December 12 to be held at the recently launched Vermosa Mountain Bike Skills Trail (MTB). Vermosa Holiday Escape will offer shuttle services from Alabang Town Center at 9:00AM, 11:00AM, and 2:00PM. Entrance to the bazaar is free. Located in Daang Hari, Cavite, Vermosa is 30 minutes away from Makati via the Muntinlupa Cavite Expressway (MCX). Get more news and updates by visiting their website www.vermosa.ph and Facebook page - facebook.com/VermosaPH.